Today on the blog, I'm picking back up in India—where I last left off in the story of our extended vagabond journey around the world. Added on August 26, 2015 by Jessica Yurasek. Black Rock City, Nevada is an otherworldly place — a destination physically accessible for just one week a year. This temporary city of 68,000 is the site of Burning Man, and it holds more magic and wonder than many places on earth. Added on April 25, 2014 by Jessica Yurasek. We've flown north, through Mumbai and then east to Aurangabad to visit another impressive art historical site—the 2,000-year old Buddhist caves of Ajanta. Added on July 12, 2013 by Jessica Yurasek. I've grown to love late night arrivals. A blanket of darkness wraps around everything keeping it secret until morning's unveiling. There are so many unknowns that come with travel: Will this new bed have bugs in it? Will I die in a rickshaw? Will there be toilet paper? All that is unfamiliar dawns the next day. Ok, maybe not all, but at least you get to see where it is that you've landed. Added on March 1, 2013 by Jessica Yurasek. India is a land of beauty and adornment with colors, textures, and patterns abound. It's also a place of curiosities. Mash these two things together, the surprising with the decorative, and you'll find some pretty unique things. One of my favorite examples of this is the beautifully incongruous hand-painted semi truck. 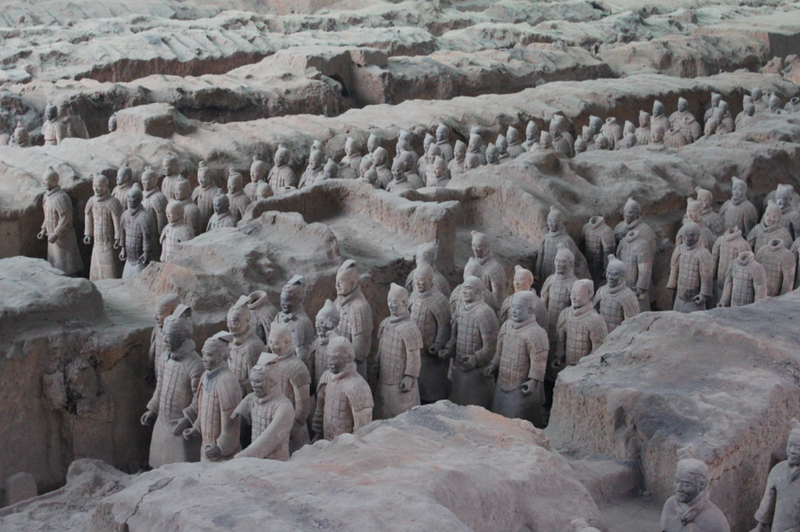 The largest excavation pit of the terra-cotta soldiers containing 6,000 figures from 210 BC. No wonder it's a UNESCO site. Added on December 14, 2012 by Jessica Yurasek. There is another gap in the Great Firewall so I'm taking it and skipping forward to post about this: the great terra-cotta soldiers. This army is one of those historically important art sites that I've always wanted to see in person, ever since my undergraduate days of art history.